The Flux Baja V2 takes over from the awesome Prime Baja and gets even better! Now sporting an upgraded steel planetary geared differential to transfer power to the rear wheels, a powerful brushless motor and a vivid new colour scheme while still incorporating all the things that made the original a winner. With fully adjustable suspension, long travel oil filled shocks and amazing amounts of articulation, you get good ground clearance and the ability to drive over the most technical of courses with ease. The Flux Baja V2 includes a 3421KV brushless motor, 7.4v 3200mAh Li-Po battery, water-resistant ESC and steering servo, 2.4GHz transmitter and receiver all in one ready built package! Just add a suitable 2 Cell Li-Po balance charger and you're ready to race! 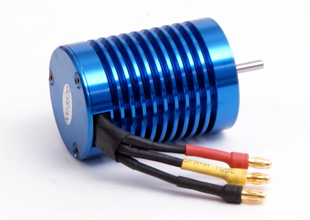 The Flux Baja V2 features a powerful brushless motor system with CNC casing and built in cooling fins. The Flux Baja V2 features a new planetary differential unit, with steel, beveled drive gears to ensure maximum strength and efficient drive transfer to the place you need it most, the rear wheels.